I love this appetizer as a substitute for vegetables and dip because it is so colorful and easy to transport. Perfect party food! - Roll out Pillsbury Crescent dough out onto greased baking dish. Bake @ 375° for 12 minutes. Let cool. - Cream together cream cheese, sour cream and Country Herb Dressing & Dip Mix. - Chop vegetables into small bite size pieces. As pictured in photo, my favorite combination of vegetables for this is approximately 1/2 head broccoli, 1/2 head cauliflower, 10 radishes, and a red, yellow and orange pepper. 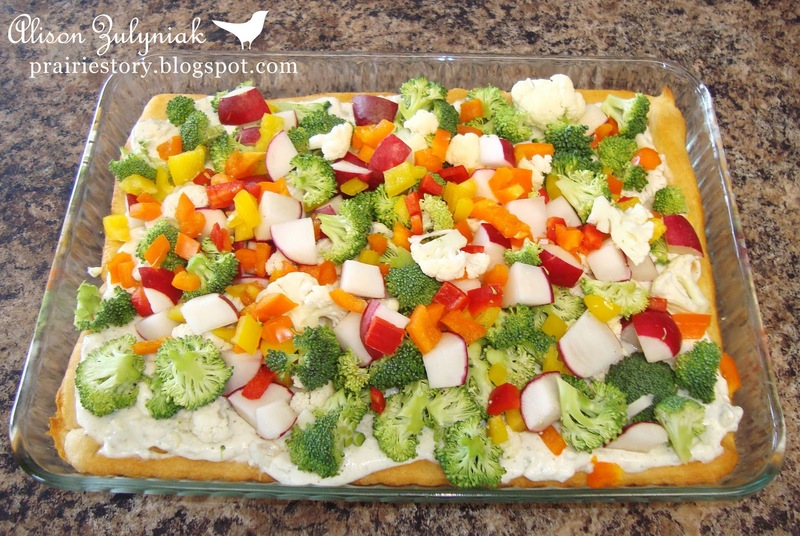 - Spread cream cheese mixture over baked crescent dough, then top with vegetables. Press veggies down into spread to help them from not falling off. - To serve, cut into squares. Oh, I just had this last night and I love it! It's been awhile since I've had it and forget to make it. YUMMY!